The current café racer and “brat-style” bike craze works hard to create a low, street-racer silhouette, often at the expense of suspension travel. 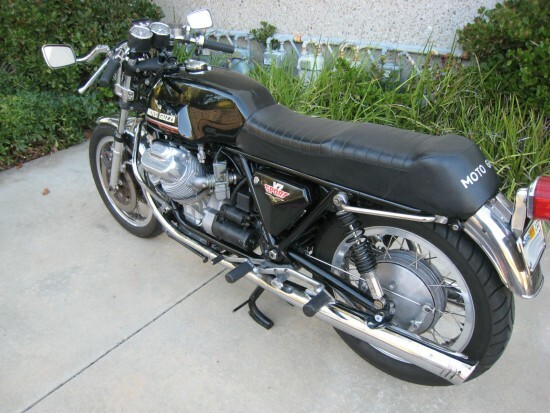 But Moto Guzzi’s V7 Sport had low-and-lean included, with no additional charge. With the cylinders of the big, longitudinally-mounted v-twin jutting out to the sides, the frame and tank could sit in the valley of the vee, instead of having to take the long route over the top, for a low center-of-gravity and sleek good looks as standard. Earlier “loop-framed” Guzzis like the V700 handled well enough and were great touring machines, but they weren’t light enough or low enough to really cut it on track. So Lino Tonti created a brand new frame to wrap around the slightly smaller, sportified twin that had 52hp measured at the back wheel. Detachable frame rails allowed the engine to be easily serviced, and that same design was used in one form or another well into the modern era. 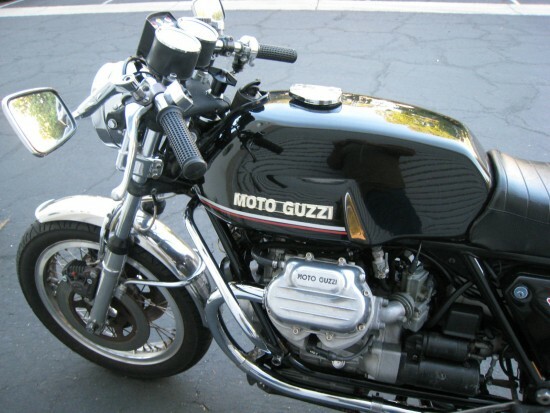 Surprisingly, shaft-drive was retained and has become something of a signature for Guzzi. While shaft-drive is great for touring bikes and require less maintenance than a chain and set of sprockets, it’s generally not used on sportier bikes as it can add significant weight, and the torque-reaction can cause unfavorable handling characteristics. 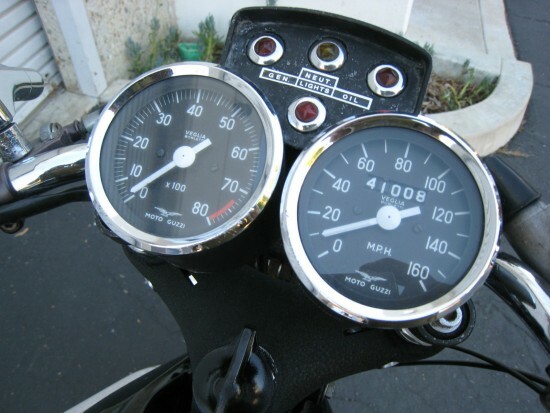 But while the rotational mass of the engine and driveshaft can be felt when rolling on or off the throttle in corners, the effects are generally very mild and riders quickly adapt. 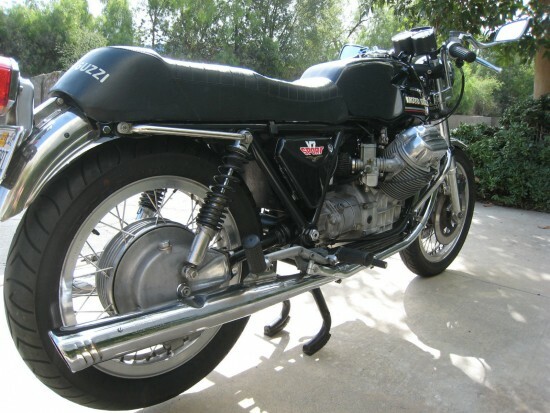 This is a 1974 Moto Guzzi V7 Sport. It has dual front disk brakes from the factory, superior stopping power, so this is probably one of the last before they changed to the Lemans sport model. I have owned it for over 12 years. during which time I upgraded the electrical system to a much more dependable one. I changed the ignition system to an electronic one with the matching Dynatek coils. It has a solid state voltage regulator. The front brakes lines has been replaced with stainless steel brake lines. The front fork cartridges have been replaced with the much more consistent FAC cartridges and progressive springs. The old cartridge type steering damper has been replaced with a newer, more solid version. The mirrors are Napoleon Baren TT. Other than that the motorcycle is pretty much stock. 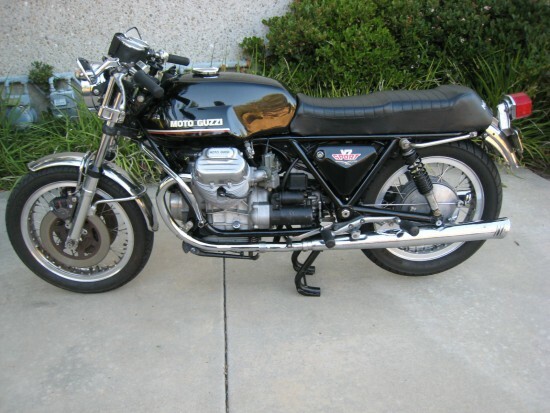 It has 41,000 miles on the clock which in Guzzi time frame, it is still a baby. I have done a major fluid change and valve adjust recently. This bike has been cared for and serviced on time all of its life, I am its third owner and I can say that it has never slept outside, always garaged and cared for. This is one of the 152 V7 sports brought to the US in 1974. The bike runs great and handles even better. I love this bike but I am parting with some bikes now and this one has to go. Interestingly, this is one of two nice V7 Sports for sale at the moment, and although the other features the very classic drum-braked front, this example has better photographs. It’s also the less expensive of the two, although with a Buy It Now price of $17,840.00 it’s not cheap. It is, however, in very nice original condition and those dual front discs should probably work better in real-world riding than the more stylish drum. 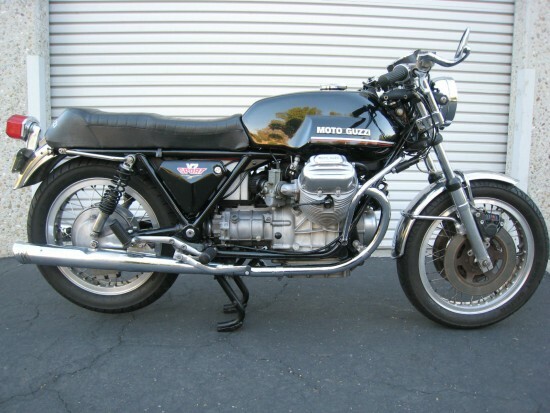 Mileage isn’t particularly low but this, as the seller mentions, is no concern for a Guzzi. All-in-all, a worthy addition to anyone’s real or fantasy garage. I have one that is pretty much exactly like this bike–black with disc brakes. To me, the Tonti Guzzis are the only thing that feels like a real motorcycle. And you are right on with your observation that everyone seems to be trying to replicate the low-slung look of this bike today. If I had to make a complaint about the Sport it’s that there is so little you can do to really improve it. Replace those cool shark’s-gill mufflers with some hi-flo units? No way! A fairing would be nice, but do you really want to spoil the purity of this look? No! It’s just about perfect as you see it here. Best of all, you just set the chokes, and turn the key–off you go. No drama, and none of the high-strung manners of a period Ducati. While I can understand that these thing don’t have the dollar value of a 750SS, there is no way they should still be this cheap. This is one of the best looking bikes ever created, in my opinion. Shhhhhh! Someone might read this and I still can’t afford one at THIS price! What Aaron, Hegira and Tad said X 1000. I wish this was for sale in Australia. It’s EXACTLY what I’m looking for. And the price!!!! Cheap as. Le Mans 1s are selling for upward of $25,000AUD here and this bike is rarer and, dare I say, purer in execution of what a classic cafe’ racer should look like…and it’s Italian!!! !